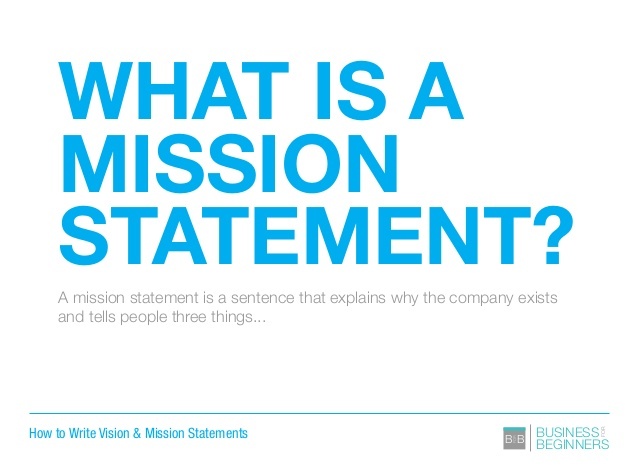 A mission statement is a statement of the purpose of a company, organization or person; its reason for existing; a written declaration of an organization's core purpose and focus that normally remains unchanged over time. (3) communicate a sense of intended direction to the entire organization. A mission is different from a vision in that the former is the cause and the latter is the effect; a mission is something to be accomplished whereas a vision is something to be pursued for that accomplishment. Also called company mission, corporate mission, or corporate purpose. The mission statement should guide the actions of the organization, spell out its overall goal, provide a path, and guide decision-making. It provides "the framework or context within which the company's strategies are formulated." It is like a goal for what the company wants to do for the world. Key market: Who is your target client or customer (generalize if needed)?